June 1678 A lease involving John and Johane Hyne of Ipplepen and Thomas Witheare, yeoman of Ashburton, concerns a house in St Lawrence Lane. The building was currently a stable, but was formerly a slaughterhouse. By 1727 the lease was for a house formerly a slaughterhouse, then a stable, but now fallen down to the ground. In 1732 a newly erected dwelling, formerly a slaughterhouse, was leased in St Lawrence Lane. In 1711 Furse close, part of Bayland tenement, Ashburton, was leased for a year at a peppercorn rent*. One of the parties was Hugh James of Ashburton, yeoman; the other was Robert Foote, also of Ashburton, a butcher. 1766 Richard Bales, a butcher of Ashburton, was one of the parties to a lease and release of various lands and properties in Ashburton. Puttisham Wood, Buckland in the Moor, was leased for a year in 1766. Winifred Smerdon, a widow of Ashburton, and Richard Ellis of Ashburton, butcher were one of the parties; Richard Smerdon of Plymouth, a butcher, was the other. John Ireland, butcher, was one of the parties to a lease and release for a messuage, tenement, orchard and herb garden in Cad Lane in 1733. According to the website of Westminster Abbey John Ireland, who later became Dean of Westminster, was born on 8 September 1761 at Ashburton, the son of butcher Thomas and his wife Elizabeth. Amongst the sacrament certificates* held by the Devon Archives and Local Studies Service are ones for Thomas Ireland, an Ashburton butcher, for various dates between 1762 and 1774. The reference is for one in 1766. *An oath of loyalty to the Crown and to the Church of England. Thomas Ireland, butcher, takes on Thomas Endle as an apprentice in 1783, Richard Smerdon as an apprentice in 1784 and William Ireland in 1791. 1796 Two sisters were co-heiresses at law of John Ireland, late of Ashburton, butcher, dec'd. Elizabeth (wife of John Orchard of South tawton, butcher) was one of them, and Susanna, wife of John Lemon of Ashburton, butcher, was the other. The will of James Spark, butcher of Ashburton, dated 30th October 1801, is held at the National Archives. 1821. At the Devon Lent Assize Wm Lee was sentenced to 3 months' imprisonment for stealing a quarter of Mutton from John Ireland, butcher, Ashburton. In 1839 John Pierce, butcher, gave evidence in a case of sheepstealing. He testified that some mutton found in houses of the accused was not cut up in the way a butcher would have cut it. Elizabeth Barnes, the wife of J Barnes of Plymouth, died in January 1841. She was the third daughter of Mr J Pearse, a butcher of Ashburton. April 1848. Charles Yolland, a butcher of Ashburton, married Susan Wills at Ideford. Devon Heritage Centre holds a draft will for John Hooper, butcher, dated 1850. In the 1841 census a John Hooper, aged circa 20, butcher, was living in North Street. 1855 John Pearse, butcher, died in April, aged 50. John C Matterface was a butcher in East Street. In the 1841 census William Mann, a butcher circa 35 years old, is living in East Street with his wife Elizabeth. With them are their four young children. At Christmas 1848 William Mann supervised the distribution of meat to poor families living at Holne. Sir B P Wrey of Chace House and the Reverend H Wrey of Holne Park donated the fare - a conservatory had been cleared of plants to accommodate the mutton and beef, and 'resembled the establishment of an extensive butcher'. By 1851 William is a butcher and auctioneer, and his son William, 17, is also a butcher. In 1871 William Snr is an auctioneer, but his son Thomas W, living in the same household, is a butcher. William's son William, and his daughters Betsy Ann and Maria, all unmarried, are down on the census as 'No occupation'. In October 1875 William Mann, auctioneer, a widower, married widow Laura Charlotte Kingwell at the parish church. William's father is also William, but his occupation is hard to read. Laura married again as a widow in 1880. Her husband was George Perkins, a batchelor whose rank or profession was 'Gentleman'. In the 1881 census George is 42 and his wife 60 - although her age at death in 1888 (75) appears to show that she would have been nearer 68. John Snr. may be the John Matterface buried in Ashburton in 1832, aged 62. Harriot/Harriet may be the Harriet Matterface, abode St Andrew's, Plymouth, who was buried in Ashburton in 1848. She was 82. In 1827 John Matterface of Ashburton married Ann Hallett of Teignmouth. January 26th 1829. Thomas, the eldest son of John Snr., died in St Lawrence, Newfoundland, 'In his 33d year'. John Campion Jnr. was baptised in February 1834, the son of John Campion Matterface, a butcher, and his wife Sarah. In 1840 John Campion Matterface put an advertisement in the Western Times 'To Sportsmen and Others'. Apparently a fine dog called Monarch was for sale, whose qualities involved scent and speed. Monarch was well appreciated by those who hunted with 'The Tory Pack of Ashburton Hounds'. Joe Varnham [?? ], 'That Crack Sportsmen' had been in charge of the pack, now broken up because of the absence of the dog. I suspect this advertisement is a comment on the relationship between the young Queen Victoria and her Prime Ministers. There had been a political crisis the previous year, Lord Melbourne had resigned, and Conservative Robert Peel had been expected to come to power. When the queen refused to comply with the usual requirement for Whig ladies of the bedchamber to be replaced with Tory ones, Peel then refused to form a government. September 1850 When 21 year old Thomas Matterface married Lucy Abbott in St Clement Danes, Middlesex, his father was named as John Matterface, butcher. Thomas was a draper. The Western Courier said that Thomas was of Ashburton. By 1891 Sarah Matterface, aged 83, was a butcher, an employer, in East Street. Her son William was an employee, and her brother, 80 year old Thomas Ireland, was a butcher's assistant. Charles Smerdon, born in February 1831, was baptised in June of that year at the Great Meeting chapel. He was the son of Thomas Pope Smerdon, a butcher, and his wife Ann Knott. 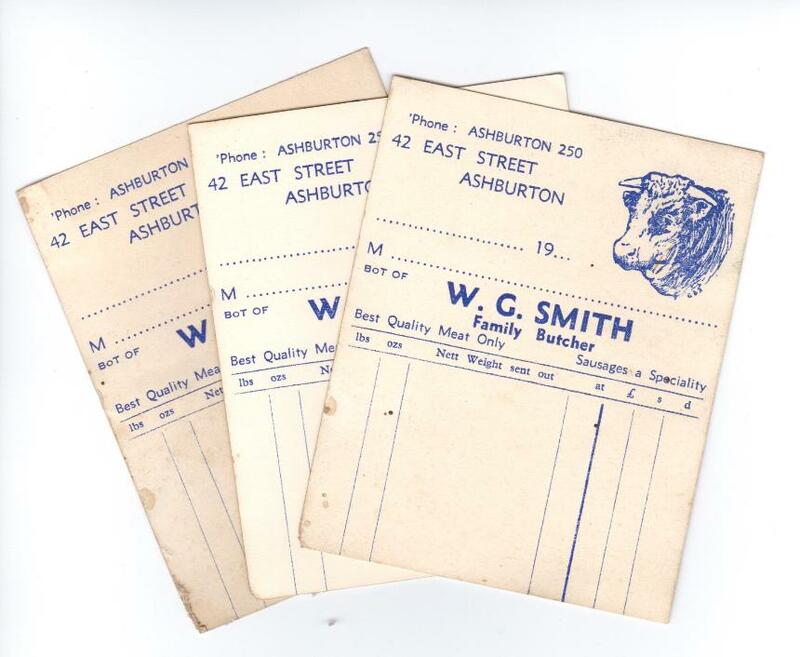 In January 1857 Charles Smerdon, a butcher of Ashburton, married Charlotte Smerdon, of Whiddon Farm. 1867 After a decree at the High Court of Chancery (Coope v Cresswell) a large number of properties and estates in Devon were up for sale. A house and butcher's shop in East Street , with Mr Charles Yolland in occupation, was one of them. 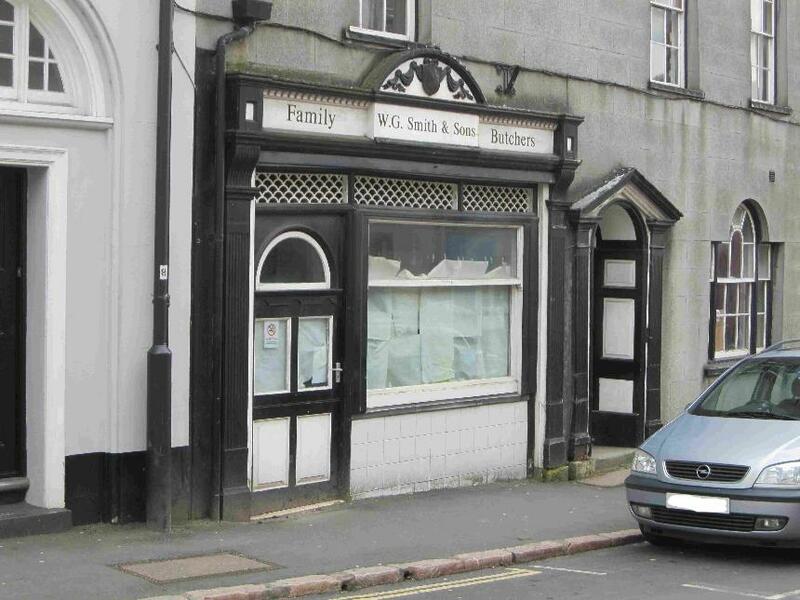 In 1879 William Willis, a butcher from Ashburton, was one of the last people to see John Hawkins, a Totnes cutler, alive. William testified at the inquest that Hawkins was perfectly sober when he last saw him - later he was found drowned near Holne Bridge. In the 1911 census Robert Mitchell is shown as a butcher in East Street, assisted in the business by his wife Elizabeth, daughter Annie, and George Poolman, aged 17. The property has a name - Hillview - but its number is not recorded: however, it is three properties down from Greylands, which we know is No 48. (See the 1900s section of People and Properties). As all the houses on that side of the street are even-numbered, Mr Mitchell and his family were probably at No 42. Above: 42 East Street when it belonged to W J Eales. In 1916 Rendell and Sawdye held an auction at the London Hotel for the sale of Nos 42 and 44 East Street. Freehold houses and shops, they were both owned by Mr C R Halse, who was occupying No 42. No 42 was a shop, house and premises with a walled garden and greenhouse; No 44 was a chemist's shop, house and premises, rented by Mr E R Moss, chemist. A side entrance led to premises suitable for a butchery business, including a slaughterhouse, cowsheds and piggeries. Mr C H Halse was the successful bidder, buying both properties as one lot for £750. 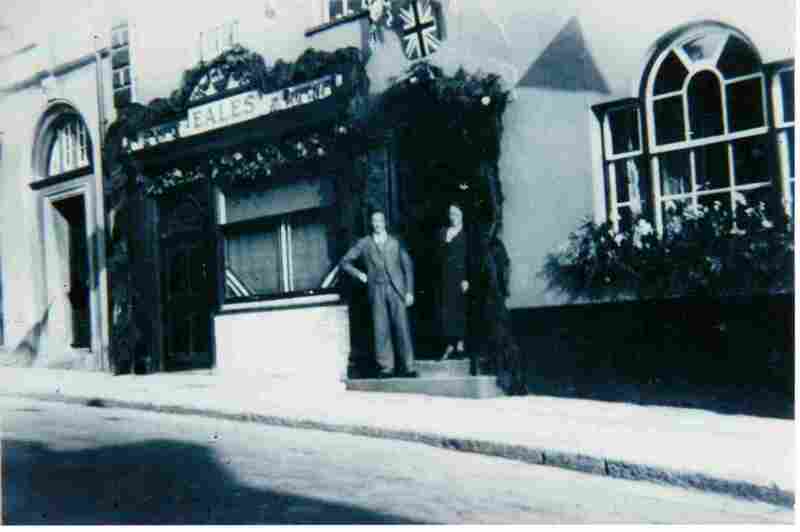 In Kelly's Directory of Devonshire 1935 Wm Eales is shown as a butcher at 42 East Street. The telephone number at that time was 50. It is likely that William is on the 1911 census as W Eales, an assistant butcher to S J Willis, in North Street. W Eales was 16, and was born in Ashburton. By the 1940s the business belongs to G B Soper. 1942 George Brendon Soper of 42 East Street was summoned at the petty sessions for employing a boy under 12 years of age. With his parents' consent the boy had often ridden in the delivery van, and occasionally took a basket and delivered goods. He received no payment for this, but the County Education Committee's case was that the boy was employed, whether he was paid or not. The case was dismissed after costs were paid. In February 1947 C C Roberts of the Forest Inn, Hexworthy, sent a letter to the Western Morning News. The letter, carried 7 miles through the snow, said that the last postal collection or delivery had been on January 29th, and the last delivery of provisions had been on Janaury 27th. The inn had been without a telephone since the first fall of snow. Mr Roberts wanted to praise Mr Soper, butcher of Ashburton, who had twice attempted to reach the villagers of Hexworthy. On February 2nd he got as far as Holne Chase, where Mr Roberts had met him with a pack-horse; on February 8th he reached Poundsgate. Mr Soper was Honorary Secretary of the Ashburton gymkhana horse and pony show for several years, and was mentioned in this capacity at 42 East Street in 1950 ( E R Tucker was joint Hon Sec at this stage). See the 1940s section of the Virtual museum for items connected to G B Soper. George Brendon Soper died in 1955, aged 49, and William George Smith bought the business at the end of July of that year. Mr Soper's gravestone is in St Andrew's Churchyard. Information about George Smith acquiring the business came from the family. 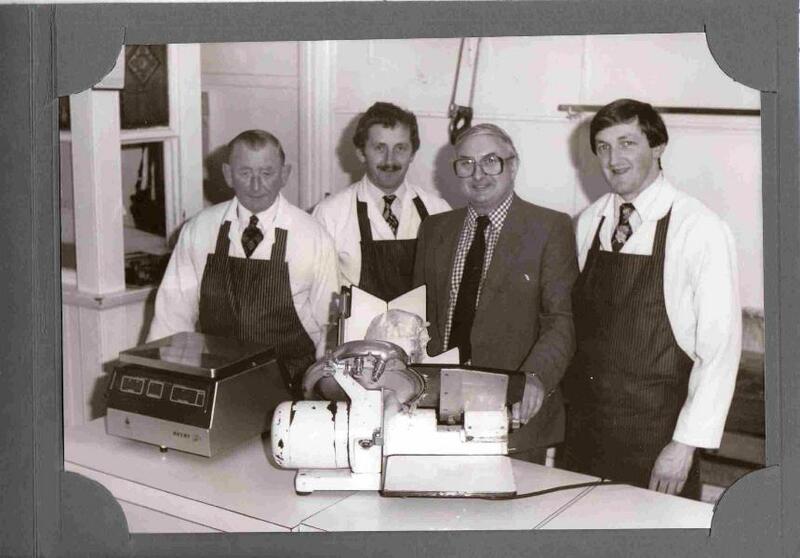 Above: This picture was taken when a company producing machines for slicing ham discovered that Smiths' had the oldest working model in the country. 'They gave us a new one'. Left to right: George Smith, son Arthur Smith, representative of the company, son John Smith. 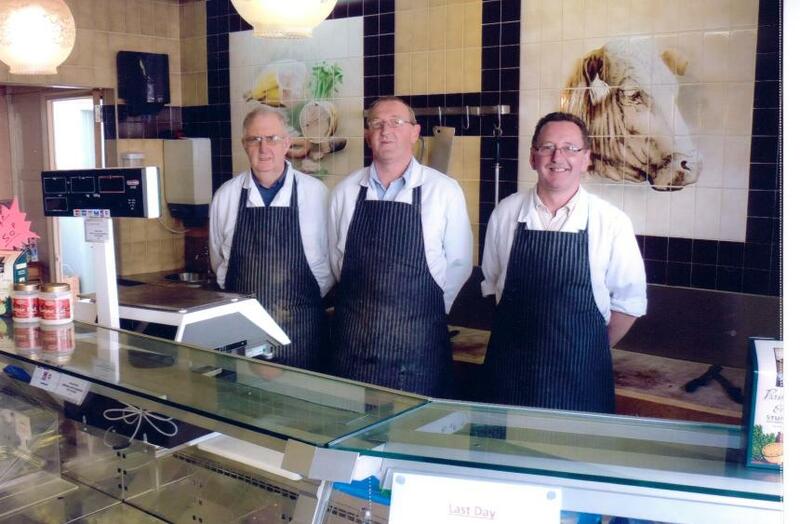 George died in 2002 - Arthur and John ran the shop for another 10 years before retiring in 2012.